The original and genuine Bigsby vibrato unit. Originally manufactured in the mid 1940's and is still being made in the U.S.A. today. The B7 is ideal for Les Paul, ES-335, and ES-175 models. 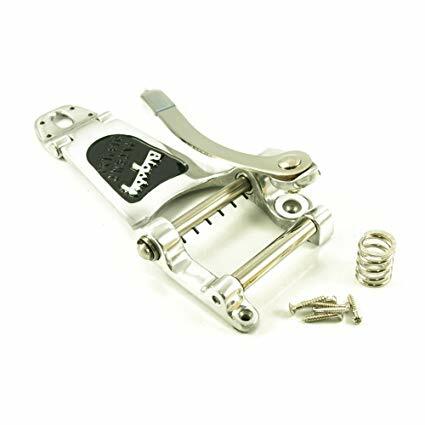 It comes complete with an aluminium arm, a spring to support the vibrato mechanism and 6 mounting screws - four to attach the unit to the side of the guitar and two to hold it down on the front. It has a cast aluminum frame. Fitting instructions are included although we recommend a local guitar Luthier to fit it for you if you are unsure about carrying the work out yourself.